The sparkling of lights, glitter shining from every surface, soft jingle bells being heard through the halls. Everything just feels magical around Christmas time. I did a rustic Christmas tree last year and I will be continuing with that theme this year. I visit the fancy stores, my cart fills up, and I can hear my bank account screaming. But decorating for Christmas doesn’t have to be expensive. I’m going to show you two DIY rustic ornament ideas for your Christmas tree. You have heard us mention Dollar Tree many times. It is our go-to stop before a DIY project. They finally took our hint and sponsored a post. Totally kidding. This is a sponsored post, but without hint throwing. Thank you to Dollar Tree for this opportunity. In order for some beautiful rustic decor, you will need burlap and twine. Lots of it. I may have gone overboard with it. But that’s okay, because it’s only $1 per spool. You will need a pack of ornaments. It doesn’t matter what they look like. You can get the ugliest ones you can find. We are just going to cover them up so it doesn’t matter what they look like right now. Ribbon. Pretty jingle bells. I picked silver. You have your choice between silver, gold, red, or green. Glue gun. First up, I did a burlap covered ornament with twine. 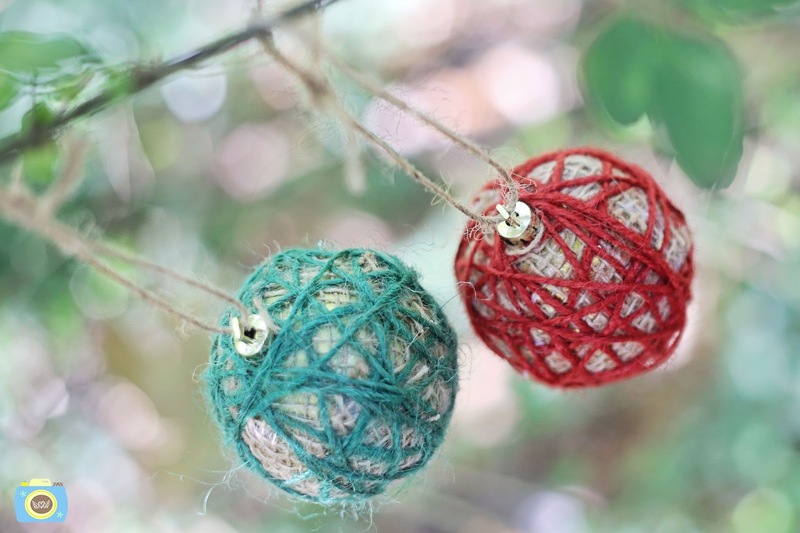 Cut strips of burlap and then hot glue them to your ornament. This doesn’t need to be perfect. Those imperfections add to the rustic theme plus most (if not all) will be covered with twine. Next take your twine and start wrapping it around in different directions, making sure to cover any of those imperfections. They have red and green twine available. So I made one with red, one with green, and one with both. Then use some twine to tie on it for a hanger. Next, a ribbon covered ornament with jingle bells. Thread a couple jingle bells on some twine. This will be used to tie the ribbon on the ornament. 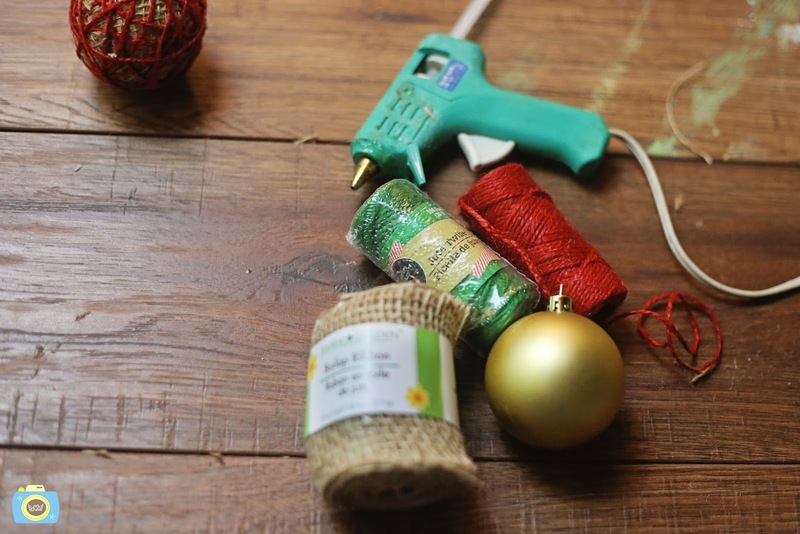 Also use some twine to make a hanger for your ornament. Take two strips of wide ribbon. Wrap your ornament with the ends sticking up at the top of the ornament. Make sure your twine hanger is sticking out. Tie the ribbon at the top with your bell twine. Glue won’t be necessary. You can change both of these ideas up with different ribbon, color twine, and accents to create a completely different look for each ornament. The possibilities are endless. We explain a little more in detail and show you the step-by-step process in the video. There you have it. You just made some beautiful rustic ornaments and no one will ever know that you didn’t spend a fortune on them.